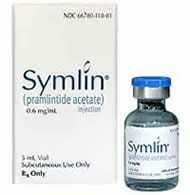 The Symlin medication is an injection that is prescribed to patients with the type 1 as well as type 2 diabetes. An individual that need insulin injections takes this medication as well to assist in controlling their glucose levels. This medication helps the stomach to digest food slower so the insulin can work towards breaking up the table sugars and carbohydrates in the system. The injection is used with insulin right after a meal so the blood sugar levels always stay within a safe range. Even though, the Symlin injections need to be taken around the same time as the insulin, a person cannot mix them into the same syringe. Always use two different syringes and take both medications around the same time after a meal. It is vital to remember to always follow the doctor’s instructions. Taking two types of injections may be confusing to some people. It is important to ask any questions or address all concerns before using the medication. All directions must be clear and precise. The dose of the medication may be different at first than at later times. A physician may begin this regiment slowly, so the body becomes use to the injections. Patients with type 1 diabetes might have a different dose than those of the type 2 version. The physician must be completely aware of the kind of diabetes that a person has. A mistake can cause adverse effects in the body’s system. Be sure that everyone is on the same page. There is certain information that all patients need to be aware of before they begin the Symlin treatment. Everything should be explained by the doctor. Understanding every piece of information is vital to the well-being of the individual. Discuss anything that is not understood right away so mistakes do not happen. An individual needs to learn the how to manage their blood sugar levels accordingly. This includes checking their glucose often each day. They need to be taught all the warning signs of high as well as low blood sugar. Some of the symptoms of low blood sugar are dizziness, sweating, fatigue and a fast heartbeat. The high blood sugar warning signs are as follows; extreme thirst, vision problems, overly hungry and changes in mood. Ask the physician for a list of all the symptoms associated with these problems. A correct diet and exercise regiment is vital to maintain the sugar levels in the system. If an individual is having problems sticking to this type of program, there is assistance available. Allergic reactions are rare. However, as with all medication, an individual may experience this. There are two types of reactions that can occur. If the injection site is red, swollen or itchy, change location. The symptoms should leave within a few days, if they do not seek medical advice. A system reaction is much more severe. The warning signs for this could be difficulty in breathing, a large rash or hives. Seek medical treatment immediately if this occurs. Side effects can occur. It is important to discuss with the doctor how to deal with these issues properly. An individual must be aware of when to contact a doctor in case of a medical emergency. There are common side effects associated with Symlin injections. Usually after a week or two they disappear without any problems. However, if they persist or worsen seek medical attention right away. The symptoms include but are not limited to nausea, feeling sick, stomach discomfort, unusual fatigue and light-headedness. An individual will need to watch their glucose levels often throughout the day, especially in the first few weeks. When low blood sugar occurs, it is vital to know what to do. If a patient is feeling faint or ready to pass out, seek emergency assistance right away. A person that is experiencing mild problems need to check their glucose level. If it lower than recommended, eat a piece of candy and wait for about 30 minutes. Then test again. When the blood sugar is still lower than normal, contact a medical care provider immediately.